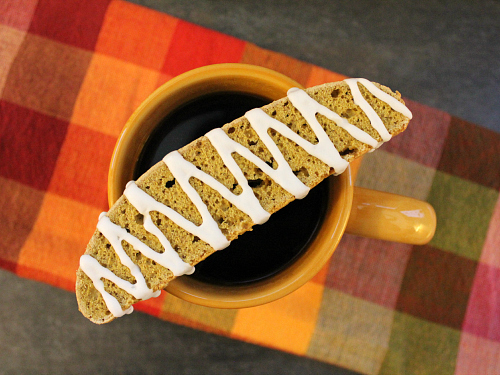 without a doubt, biscotti are a popular coffee house cookie. their crunchy texture makes them the perfect treat to dip into a cup of warm coffee, tea, or hot chocolate. i have never found myself drawn to biscotti in cafes since they tend to be overpriced and hard as a rock. however, as is the case with most baked goods, the homemade version is a whole different story. i needed to bake a treat to bring into work for my co-worker's birthday last week. 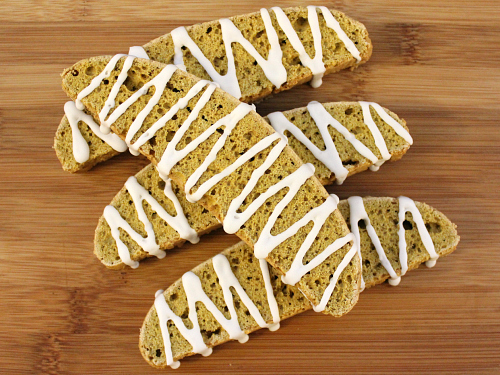 instead of making cupcakes or cookies again, i decided to change things up a bit and to make these pumpkin spice biscotti. biscotti are so easy to make at home. just a few simple ingredients. these biscotti are loaded with a ton of spices. our whole house smelled absolutely amazing as they baked in the oven. they smelled just like pumpkin pie baking. (the smell even lingered around until the next morning. it was great.) the pumpkin and the spices are a perfect combination. for an little bit of extra pizzaz, i drizzled royal icing over the top of them too. 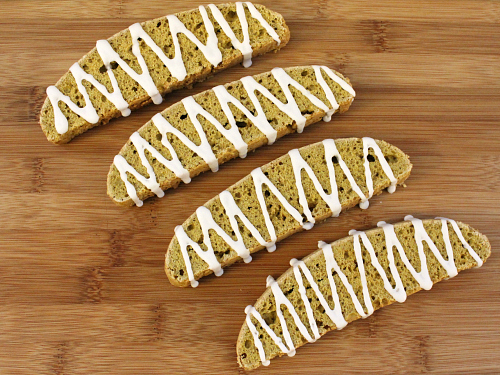 these biscotti are full of flavor and they are not too sweet. 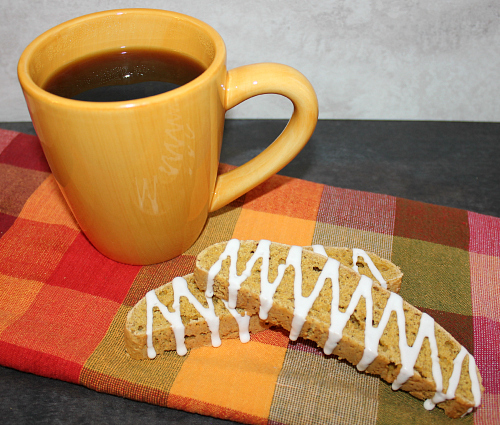 they are the perfect companion to a warm cup of coffee on a chilly fall day. needless to say, there were a huge hit at work! preheat your oven to 350 degrees F. sift together the flour, sugars, baking powder, spices, and salt into the bowl of a stand mixer. add the eggs, pumpkin puree, and vanilla to the dry ingredients. mix until all of the ingredients are incorporated. (if the dough is a bit too sticky, add up to 1/4 cup of more flour.) using two spatulas, spread the dough out on a cookie sheet lined with parchment paper. form the dough into a long oval loaf (approximately 15 inches long by 6 inches wide.) the loaf should be only about 1/2 inch high. bake for 30 minutes, until the center is firm to the touch. remove the loaf from the oven and allow it to cool for 15 minutes. using a serrated knife, cut the loaf into pieces. (either 1/2 inch or 1 inch wide depending on the size of the biscotti you desire.) lay the cut pieces on their sides on a cookie sheet lined with parchment paper. reduce your oven temperature down to 300 degrees F and bake the cut biscotti for an additional 20 minutes. 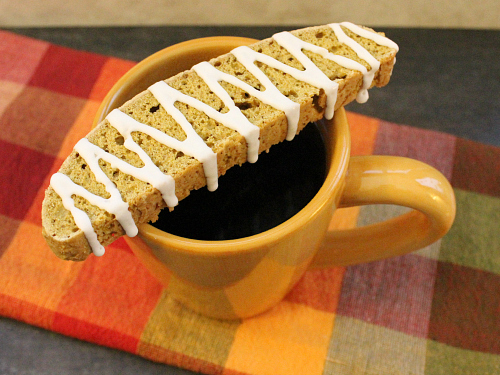 once baked, allow the biscotti to cool completely. once completely cooled, drizzle with royal icing if desired. note: the biscotti will be a tad moist and chewy. if you prefer traditionally crisp biscotti, let them sit uncovered overnight in a dry space. These look delicious. I will have to remember to try out this recipe. They were tasty. Would be good with that cup of cider or coffee.